Jemully Media began in 2011. Over the years, our agency has employed writers who have not only produced content marketing for our clients, but they have also treated our own agency as one of our clients. Unlike the oft-neglected cobbler’s children, we take pride in the application of the very same recommendations to our own marketing efforts that we prescribe to our clients. The results are exciting! And, we are able to use our own success as a case study. To date, our team has published around 175 blog posts on nearly every marketing topic under the sun. Tips for using various social media platforms have been shared; best practices for website creation and SEO have been discussed. Likewise, various industry trends have been dissected. Oddities like marketing lessons gleaned from the Pumpkin Spice Latte phenomenon, the correct pronunciation of “GIF,” and our staff reading list have been published. In conclusion, all of this writing serves the purpose. The articles provide a useful repository of marketing knowledge that sets us apart. Our content differentiates us from our competition, in the eyes of Google, with prospective clients, and with our readers at large. Through the years, we’ve refined a core 5-step SEO process that works well. Admittedly, a deep dive into SEO and its ever-changing criterion takes much more than 5 steps. Google has a list of 200 factors it weighs against a site for ranking. And its mid-2018 guide to determining search quality rating is more than 160 pages long. 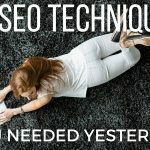 However, this handful of actions we focus on, if they are repeated over time, will deliver success with a sound footing from which you can submerge yourself in some of the more sophisticated SEO actions. As to our system. Not only does it position our website as a marketing resource, but it also brings our small West Texas agency clients from coast-to-coast across the United States. As a bonus, we’ve had a couple of internationals as well. Because we apply the strategic SEO process we developed, our organic traffic is high. Consequently, we no longer have to spend our marketing dollars on PPC campaigns to maintain our lead generation. This is our proven case study. Above all, this is our best recommendation. Similarly, it is evidence that if all the pieces of the process are employed, they work. Unfortunately, when they look at the process, business owners often choose to just pick “this piece” of the process, or they choose only “that piece” of the process. Then, they hope for the same successful results. Their efforts fail. Why? Because success requires all the pieces to work together, in tandem and in balanced harmony. As a result, when you gain solid page rank on Google, you save on the advertising expenses and reduce your paid advertising on Google and social media. For anyone who has invested in pay-per-click advertising, you know the significant savings this brings. This is the power of a sound SEO process that adheres to best practices. Steady growth from the SEO long game. This Google Analytics graph shows the steady growth in traffic our website has experienced since mid-2016. First, let me point out that in the early going of your SEO process, Google Adwords and paid social media advertising are important tools to employ. As you can see from the chart, there are spikes of traffic during the times we increased our Adwords campaigns. We are a fan of paid ads, at key points in the marketing process. 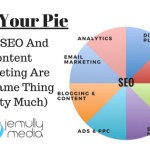 Jemully Media has invested in SEO to grow our website traffic and save on paid advertising dollars. You will also note that by the Fall of 2017, our organic content had gained enough traction that we were able to stop spending large amounts of funds on our paid ads. Then, we were able to invest even more heavily in writing content. Pro Tip: The content we develop for ourselves (and that we develop for our clients, if they avail themselves of that service) serves two key purposes. One purpose is to write to generate general organic traffic. These pieces can be fun or editorial pieces that are loosely related to your industry. The other purpose is to write content that helps your potential customers. This content will generate targeted traffic that produces business leads. Together, these two kinds of content continue to increase our website traffic, return high Google page rank, and deliver new customers to our door. If you will apply all five steps of this SEO process, you can achieve similar results for your business. 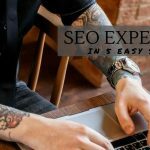 Read on for a step-by-step guide to playing the “long game” that SEO requires and setting yourself up to reap these benefits for your own company’s website. Let’s say you’ve got a website that is not showing up well on Google. Maybe you’ve got a brand-new website. Or maybe your business has had a website for a while, but you don’t have good page rank. You’re thinking… “What’s the quickest way for me to grab the number one spot on Google for my most relevant keywords?” If that is the question you are asking yourself, let me impress upon you that there is not a quick SEO / keyword formula to get your site to appear on the first page of Google’s search results. In addition, if you have been told there is a shortcut to good organic page rank, then you have been misled. SEO is a long game that takes time, effort, and strategic planning. But, you will discover that the results are well worth the investment. The fact is, SEO is the opposite of a quick solution. SEO is an on-going process that bears fruit over time. The process starts with a decision to commit to investing in your business for the long haul (something you, of course, want to do). Then, you engage in a process that does not end. To begin, step one is to make a list of all the relevant and desired keywords (KWs) that you would eventually like to rank well for. If possible, rank these by how relevant they are to your individual business. For example, any keyword or phrase that includes your company/website name, and/or perhaps your specialty and location would be extremely specific and relevant to you. This type of list, ranked by relevance, doubles as a list of the easiest keywords for you to rank well for. Pro Tip: This is the place to start. There will be other keywords that you’d like to rank for, but it’s important to start with the KWs holding the most specific relevance to you (i.e., the easiest ones to rank for). It can take up to a week for search engines, like Google, to index your website, but within the week, you stand a good chance to begin appearing on the first couple of pages in the search engine results (SERP) for searches that are uber-specific to your site. Step two is to make sure your site has excellent on-page SEO. This means your page titles, URL, metadata, images, etc., are all optimized on every page of your website. Each page should be optimized for one of your most essential keywords. This is actually not difficult if you are a good writer and you know the key elements to optimize. Pro Tip: Some of the key elements of on-page SEO include how the content is written. Keep your paragraph length under 150 words. Then, keep most of your sentences to less than 20 words. Weave the related keyphrases into your content so the message flows naturally. Keep the voice active and use transition words frequently. Back to your ranked list… Once you are showing up on SERPs for basic searches (like your company name), you have a baseline. Step three should be executed concurrently with step four. Focus this phase of your optimization efforts on a very small number of things you do best. In the early stages of your site’s operation, you may be looking for ways to increase your site’s content offerings and overall footprint. Depending on your business and goals, this principled expansion of your website may come in the form of blog posts, new services pages, FAQs, or a combination of these and other types of content. Write to benefit your industry. Write naturally. This is the time and place to begin systematically creating content optimized for those more specific KWs in your industry. Take time to develop readable and sharable content that is educational, informative, and even entertaining for your audience. Do not be afraid to establish a point of view that will set you apart. As you write, incorporate keyword groups, lumping together KWs, phrases, and close variations that can all work together on a single post. Given the limits of metadata, you can only truly optimize each page for one KW. The key is to include these words in a way that makes sense to readers. You may be trying to please Google, but Google is trying to please readers. Google’s goals are all about reader service in the end. Therefore, write naturally. Keep writing to lay a foundation of content. In time, search engines and internet users alike will gradually begin to associate your site with all of the well-written and KW-rich content on your pages. Eventually, your site will be seen as an authority on your subject matter. This is one of your goals. Laying this sturdy foundation takes time. Therefore, writing fresh content on industry-related subjects will pay off in the SEO long game. It does not happen all at once. And, the span of time will be different based on for each industry. Pro Tip: After you address most of the important topics in your industry, you can begin to write additional, more in-depth content on each of the subjects. This is a good place to be because you’ve laid the foundation of a website that can address as many tentacles of your field as you care to. Once you’ve established this breadth, anything you add in your continued content marketing efforts will bolster your depth. Step four is to remember that good, impactful SEO takes time and discipline. To bridge the gap between humble beginnings and becoming established, enhance your content development by deploying pay-per-click (PPC) campaigns. For example, invest in Google AdWords and social media paid ads. PPC should not be mistaken for SEO. However, PPC it is a complementary component. It essentially lets you buy your way to the first page of results while you build your website’s valuable content resources. A strong PPC campaign starts with a strong website. If you are going to start paying for clicks, then your ad must link to a strong landing page. For some, your home page says it all. For others, you want to promote a specific blog post or services page. Invest the necessary time to create a well-conceived landing page for your ad traffic to land on. The landing page should meet and exceed the expectation created by your ad. If your ad promises one thing, and your landing page communicates another message, then your money is not well spent. You will only be throwing away your ad budget and driving up your bounce rate. There should be no dissonance between your ad and its landing page. Potential pitfalls aside, PPC advertising has many virtues. Again, it is not to be confused with actual SEO, but PPC, especially Google AdWords, does allow you to bid for whatever ad placement you like. Through bid optimization, you can be sure to snag the top ad spot. Or, you can simply bid high enough to land somewhere in the top 2 or 3 slots. Pro Tip: Paid ads only display in the areas Google has designated for ads. And, they are labeled as “ads.” The ads do not appear among the 10 organic results per page. Some users will not click the ads. They prefer to click the unpaid results from the organic list. Organic placement must be earned. It cannot be bought. Link building is the process of getting your content out on the web and linking readers back to your website. If you have a lot of content, then you have the opportunity to share it across all of your social media platforms. Another important tactic in link building is to repurpose your content in email marketing campaigns. These external links drive traffic back to your website. And, the social media and email marketing give readers easy ways to spread your content around the web to others. These and other link building techniques are key components in Google’s eyes. The question Google’s page rank algorithm seems to ask is, “are people sharing and talking about this site’s content?” If so, this indicates a site that has more potential value to a reader than a site that is not dynamic and engaging readers. A website of relative breadth and depth is designed to attract readers. Many readers will be repeat visitors who remain on the site longer and read multiple articles in each session. These people are either potential customers or likely to recommend you to their friends. You might consider them fans. Engage with them when possible. Pro Tip: Keep an eye on your website’s analytics. Watch which content is working the best. Equip yourself to make data-driven decisions about future writing topics. The more content you have, the more data you have to guide you. Keep your content machine running at all times. You don’t have to publish daily or even weekly. Jemully has averaged just under 2+ posts per month dating back to the beginning of the company. Sometimes you post more frequently, sometimes less. You only need to publish often enough to keep in touch with your readers. Pro Tip: Stick with your strategy. Utilize all the steps in the SEO process. You will be able to scale back your paid advertising spend. Then, you will have the flexibility to reinvest the ad dollars into your business in other ways. You can create richer content and/or strategically boost specific posts on social media. This is the path that Jemully has taken, and the results speak for themselves. It is also the path that we recommend to clients. Get serious about content marketing. Be your own media. Create and expand your brand’s persona and expertise through thoughtful content generation. It’s something we’ve been saying for years, but content marketing and SEO are intertwined more than ever before.